Descubra o espaçoso apartamento 750 sq. Ft. Estúdio com 13 pés tectos altos catedral, janela vista para a montanha expansiva e 2º andar varanda coberta ao ar livre com vista para o lago de carpas, cascata e jardins luxuriantes. Localizado ao lado da casa principal, onde os proprietários vivem, você terá sua própria entrada privada e experimentar a privacidade completa. Este espaço extraordinário é usado exclusivamente para aluguer de férias, por isso é equipado com mobiliário verdadeiramente luxuosos e amenidades que você vai adorar. Tudo isso combina para tornar a sua estadia em Santa Barbara inesquecível. Nosso quintal tropical e cachoeira faz você se sentir como se estivesse em Bali. Jardins caprichosos e criativos que farão com que você fale sobre eles por meses depois - especialmente as inovadoras camas hidropônicas. Perfeito para 1 ou 2 pessoas aqui em negócios ou uma escapadela romântica. Lareira, cama king-cal com colchão e roupa de cama aquecida deliciosamente suaves. Ceragem - cama de massagem infravermelho distante com rolos do jade para facilitar sua volta e ajudá-lo a esquecer-se sobre todas as solicitações. Kitchenette totalmente equipada com geladeira, fogão a gás e espaço no balcão. Casa de banho completa com chuveiro de luxo e roupões de banho. Defina o seu próprio combinação para o cofre no quarto. Ginásio e pesos livres bem equipado disponível no local. Empréstimo de bicicletas e capacetes para explorar a cidade. Toalhas de praia, cadeiras e areia balde. Estacionamento gratuito e privado por trás garantir portão fechado. Internet Wi-Fi gratuita super-rápida e TV HD de tela plana grande, com HBO, Showtime, Netflix e AppleTV. Se você está procurando um espaço de retiro muito especial que é isolada, mas ainda perto da cidade, então este é para você. Fique um fim de semana, uma semana ou um mês e saciar-se em uma viagem que você vai se lembrar para sempre. Trabalhamos a partir de nosso escritório em casa e estão na propriedade quase 24/7, por isso vamos estar disponível para oferecer assistência ou qualquer ajuda que você pode precisar. Vamos, naturalmente, também respeitam completamente a sua privacidade. Casa de banho tem chuveiro, pia costume concreto navio e utensílios de cobre. Inclui aquecedor separado em seus pés para o conforto pós-banho. Having visited over two dozen VRBOs from Martha’s Vineyard to San Francisco, Mission Canyon sits atop the list. From the moment you enter the property, you are enveloped in quiet and calm. Cool breezes, lapping water and total comfort surround you. A lovely deck in the treetops is irresistible and makes you question if you really want to leave it all behind and venture out to Santa Barbara. Whatever your choice (and the town is delightful) your body will find relaxation and your mind and spirit will be restored. As for the art and whimsy, I will let it be a surprise as it was for me. A teaser: NOT TO BE MISSED. Suite Peas is a "must stay" for anyone traveling to Santa Barbara who enjoys privacy, quiet, "nature in the city", beautiful gardens and perfect accommodations--that's you, right? Then this is your place. While it is always about the accommodations, Suite Peas offers so much more than just the perfect bed with wonderful sheets and pillow options, room to roam, all the necessary "kitchen" things to more than just "get by", multiple coffee choices, a bath set up with amenities that will not only rival but exceed you best experiences in a five star hotel, plush towels, first morning (and beyond) breakfast fixings.....our list could go on and on but we will leave some things for your pleasant surprise. We must say that the gardens are really special and done with the same love, care and attention you will find inside Suite Peas. You awaken to the fresh garden smells and the sounds of birds. You finish your day on your private porch overlooking the gardens as the evening light shows itself in Santa Barbara splendor. Oh, and the "pod up-cycling" is an on-going discovery we will leave to you. Obviously, we loved our two weeks at Suite Peas. And, we left with new friends and a promise to return again to see Mindy and Evelyn and enjoy this very special place they have created. We thoroughly enjoyed our stay. The property is extremely nice both inside and out. I loved waking up to a view of the mountains and having coffee on the balcony in the warmth of the heater each morning. The guest suite is very well designed and roomy. It is well appointed and cozy as well. The nespresso art adds a unique touch and is very well done. There are many extras and my husband enjoyed discovering something new each day. 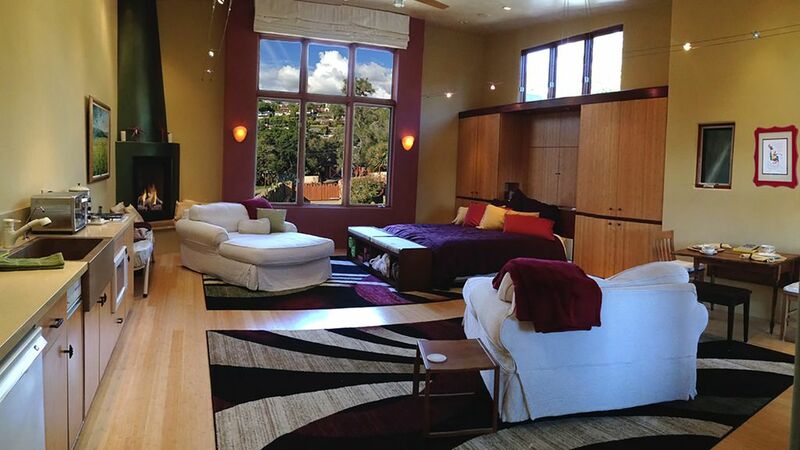 I highly recommend staying at Suite Peas when your travel plans take you to Santa Barbara. The apartment, location, and hosts are perfect. My wife and I were back for our second visit and we will return. We stay at lovely places all over the World and this is among the very best! This was our second stay at Suite Peas this year. As with the first, the accommodations were stellar - clean, quiet, with every amenity we could have wanted. As we are becoming more familiar w/ SB, this time we realized how close and convenient Suite Peas is to EVERYTHING we would ever want to do in SB or the area. Mindy and Evelyn are wonderful hosts, always taking time to answer our questions or provide suggestions when we sought them. We will plan future trips to SB around the availability of Suite Peas! We had very high expectations and were not disappointed. There are many very good VRBOs in Santa Barbara. We searched for a long time and read many reviews. When we found Suite Peas, we thought we had found the one that was perfect for us. We were not disappointed. We wondered how Evelyn and Mindy could receive 5.0/5.0 from so many reviewers. After saying with them, we totally agree with the rating. The gardens are phenomenal. We spent many hours just gazing at the gardens from the private balcony or wandering around in the gardens. I doubt there are any other VRBOs where one can enjoy all the city has to offer and then return so quickly to their own private Eden. Evelyn and Mindy were very responsive and asked multiple times if there was anything else they could do to accommodate us. They spent their time informing us about their hydroponic garden techniques. As much as we enjoyed the accommodations and the gardens, the fact that we could park our car inside their locked gate was paramount. Downtown Santa Barbara and the beach are less than three miles away so we ended up leaving the car parked and taking Lyft most of the time. Evelyn and Mindy knew that we would be driving an electric vehicle. They made sure to have a cord hooked up and ready for us when we arrived. We greatly appreciated that. We would highly recommend Suite Peas. Two (2) night stay permitted with a $100 surcharge. Not suitable for corporate events or parties. No smoking indoors or outdoors anywhere on the property. Cancellation Policy: 100% refund if cancelled at least 30 days before arrival date. Within 29 days, please read terms detailed in the Rental Agreement, which we require you to sign.